CURRENTLY OUT OF STOCK. PLEASE ENQUIRE ABOUT AVAILABLITY. The Black Swan is a 17th Century coaching inn, still retaining many of its original features. 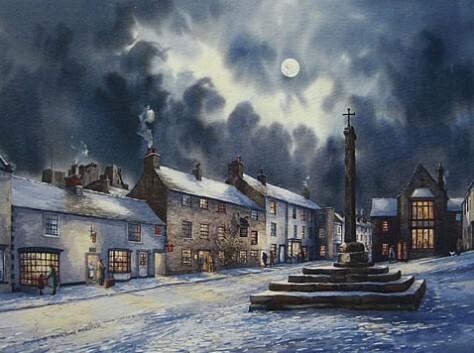 It overlooks a fine Georgian market square and stands in the shadows of Middleham Castle, built around 1170, the northern home of King Richard III and his wife Lady Anne Neville of Middleham. Since the 12th Century monks from Jervaulx Abbey have excercised their horses on Middleham Moor. Today, Middleham is home to 15 trainers and over 600 horses. Just as in days gone by, beautiful thoroughbreds make their way past the Black Swan to the gallops on the Moor for their daily excercise. 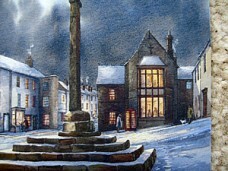 Middleham retains its celebrated past, a village in size but a town in stature. The Swine Cross at the head of town recalls the grant Richard gave in 1479 for a twice yearly fair and market. 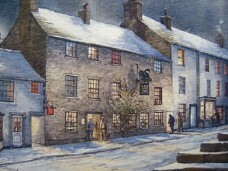 This painting depicts the town on a winter's evening after a light fall of snow and when life moved at a more gentle pace. Signed Giclee` Print approx 17"x13"